Disclosures: Research grants, consulting, and honoraria from Abbott Vascular, BD Interventional, Biotronik, Boston Scientific Corporation, Medtronic, Vycon, Terumo Europe, and Gore & Associates. Disclosures: Clinical investigator and author in the IMPERIAL trial; medical advisory board member for Boston Scientific Corporation. What were your initial reactions to the IMPERIAL results? Prof. Gouëffic: My first reaction to IMPERIAL was regarding the robustness of the trial. The methodology of this randomized controlled trial, recently published in The Lancet, is very well designed and with few biases.1 The noninferiority and superiority analyses are well described prior to the beginning of the study. IMPERIAL achieves its objectives, showing noninferiority and superiority of a polymer-based paclitaxel-eluting stent (Eluvia, Boston Scientific Corporation) over a polymer-free paclitaxel-coated stent (Zilver PTX, Cook Medical). The difference of patency between both groups is quite large (nearly 10%) and significant (Figure 1). We can also note a significant difference in terms of target lesion revascularization (TLR), nearly a two-fold TLR decrease in favor of the Eluvia stent. Figure 1. Patency rates were significantly higher with Eluvia across trials. Figure 2. The superiority analysis for primary patency was determined with a prespecified post-hoc analysis (12-month primary patency rate of 86.8% in the Eluvia arm and 77.5% in the Zilver PTX arm [P = .0144]). Dr. Holden: I was impressed with both drug-eluting stent (DES) platforms; each one performed extremely well in a challenging lesion cohort with a significant incidence of moderate to severe calcification and chronic total occlusion. The performance of the Eluvia stent was obviously particularly impressive. Dr. Holden: Boston Scientific should be congratulated for initiating and performing this head-to-head trial. In the current cost-sensitive environment, statistically powered trials that directly compare treatment strategies is exactly what physicians, patients, and health funders need. Prof. Gouëffic: Physicians have huge expectations for drug-eluting devices to improve outcomes for endovascular treatment of femoropopliteal lesions. Despite promising results for drug-coated balloons (DCBs), there remains a need for scaffolding. Intraoperative angiography to assess DCB results is not so easy to analyze, and physicians tend to use bailout stenting to avoid unsatisfactory results. Moreover, in a real-world setting, femoropopliteal lesions are more complex than typically observed in trials, so bailout stenting increases considerably. Thus, the endovascular community has interest in the ability to use DESs for a femoropopliteal lesion to prevent intimal hyperplasia, recoil, and remodeling. Since 2011, Zilver PTX has undergone the only randomized controlled trial to assess a paclitaxel-coated stent for femoropopliteal lesions. In that study, Zilver PTX, a polymer-free paclitaxel-coated stent, was compared to plain balloon angioplasty. In 2018, balloon angioplasty is no longer the standard of care for femoropopliteal lesions, and consequently head-to-head comparison between drug-eluting technologies is expected. Interventionalists are expecting data to make a choice between devices. Prof. Gouëffic: Head-to-head trials should be helpful for vascular interventionalists. IMPERIAL provides evidence that a sustained-release polymer-based DES is superior to a polymer-free drug-coated stent, which helps physicians make a choice between the two stents. However, IMPERIAL does not establish an algorithm by itself. More evidence is required to define the indications of using bare-metal stents (BMSs), DCBs, and DESs for femoropopliteal lesions. Also, according to the inclusion and exclusion criteria of IMPERIAL, conclusions from the IMPERIAL study are valuable in patients with Rutherford category 2, 3, and 4 superficial femoral and proximal popliteal artery lesions that range in length from 30 to 140 mm. Outside these criteria, high-level evidence between both devices still needs further study, despite some promising initial data from the IMPERIAL long lesion sub-study.2 This single arm included 50 patients with lesions from 140 to 190 mm. At 1 year, the primary patency rate was 87.9% and the rate of clinically driven TLR was 6.5%. Considering these data, indications for Eluvia could be extended to more complex lesions. 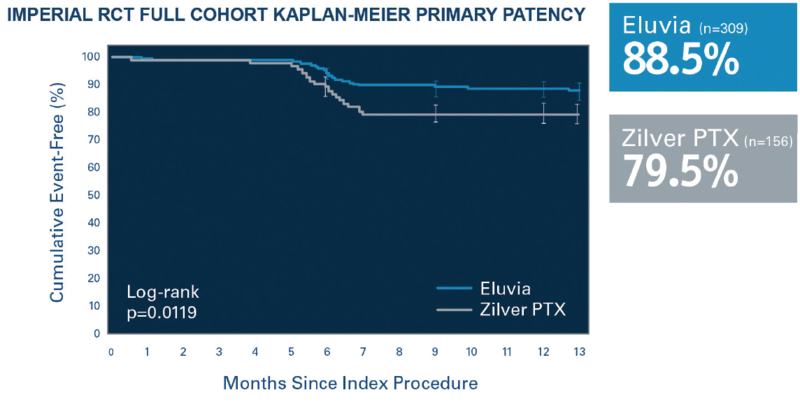 Dr. Holden: Although both DES platforms performed very well in this trial, a post hoc analysis of the 12-month primary patency in the full patient cohort revealed a significant patency advantage for Eluvia over Zilver PTX. There was also a lower clinically driven TLR rate at 12 months for Eluvia, although this did not reach statistical significance. Although there will be other variables influencing physicians’ decisions regarding choice of DES, these patency results should certainly be a major point for consideration. Dr. Holden: These results are outstanding, particularly given the complexity of lesions treated. In particular, the performance of Eluvia in the presence of severe calcification is particularly impressive and suggests drug elution may be more effective in calcified arteries than previously thought. The Innova stent (Boston Scientific Corporation), which is the BMS platform for Eluvia, has also provided an excellent platform in these challenging lesions. Prof. Gouëffic: “Leaving nothing behind” should not be an objective for the treatment of femoropopliteal disease. For each interventionalist, the question should be, “What is the best treatment for this lesion?” In the absence of comparison between Eluvia and DCB, we should be careful to extrapolate conclusions from non–head-to-head comparison. Moreover, due to the performance of drug-eluting devices, differences in patency or reintervention are becoming so narrow that it could become increasingly difficult to design a trial to show the superiority of one device over another one. For this reason, cost effectiveness and procedure times could assist with decision-making. Dr. Holden: The leave-nothing-behind concept was popularized in treating femoropopliteal disease when early-generation nitinol self-expanding stents revealed unacceptably high rates of restenosis and stent fracture. However, it is well established that scaffolds are required as lesions increase in length and complexity to manage significant residual stenosis and dissection. The combination of new stent platforms and drug-elution for restenosis has promised to significantly challenge the leave-nothing-behind approach, and the IMPERIAL trial results have certainly done that. When applying this information to lesions that respond poorly to predilatation with plain balloon angioplasty, we can expect excellent results with DES treatment, at least to 12 months, and probably longer. Dr. Holden: The IMPERIAL trial data have supported my current treatment algorithm to SFA disease. I use plain balloon angioplasty to nominal diameter to assist in the choice of subsequent drug-eluting technology. For lesions that respond well to plain balloon angioplasty, I use a DCB. For lesions that respond suboptimally to predilatation, I use a DES with the confidence of replicating the excellent results of the IMPERIAL trial. I believe this approach will result in better short- and midterm patency and freedom from TLR rates than a primary DCB approach with provisional BMS, although this remains to be conclusively proven. 2. Gray AW. 1-year outcomes for Eluvia in long lesions: IMPERIAL long lesion substudy. Presented at: Vascular InterVentional Advances (VIVA); November 5–8, 2018; Las Vegas, Nevada. 3. Bisdas T, Beropoulis E, Argyriou A, et al. 1-year all-comers analysis of the Eluvia drug-eluting stent for long femoropopliteal lesions after suboptimal angioplasty. JACC Cardiovasc Interv. 2018;11:957-966.